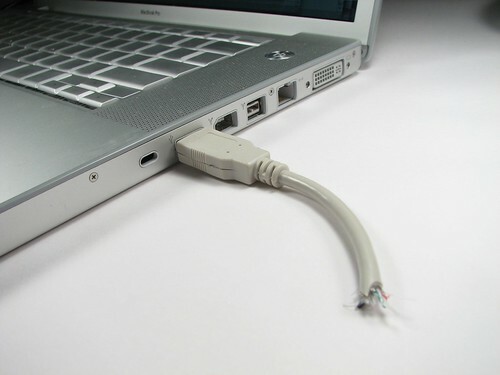 Holy crap-- somebody just went and TORE MY FREAKING USB CABLE IN HALF while it was still attached to my laptop!!! No-- wait-- sorry. That's just my USB drive. My bad. Never mind. It's no secret that there are a lot of strange USB devices out there, particularly flash drives. Not a comprehensive list, but we've sure seen Lego, twigs, action figures, bowling balls, sushi, anatomical parts, transparent drives, erasers, cassette tapes and on and on and on. Despite all that, the picture above is a little surprising-- because yes, it's a working USB flash drive. Here, we give the step by step walk through of how to make your own.